Note: This article was written by David Tarvin, a PhD student at Louisiana State University and the newest addition to the Humor That Works team. To find out more, check out his bio. Recently, a friend and I were discussing the potential GOP candidates for this year’s presidential election. He told me wished Sarah Palin had run for office only so Tina Fey could reprise her role every week on Saturday Night Live (SNL). We laughed, but ultimately, I agreed. Tina Fey’s Palin impersonation was so believable, Fox News used a photo of the SNL star instead of the politician on accident in one of their broadcasts (see the clip here). In fact, we began to wonder if Sarah Palin’s popularity could be partly contributed to her likeability as a “common clown” or “fool,” that was amplified and personified by Tina Fey. In an Argumentation and Advocacy article, Chris Smith and Ben Voth (2002) address the use of humor in the political arena and its results on presidential elections. In particular, they analyze the role SNL had in the 2000 presidential election between George W. Bush and Al Gore (a low quality clip of the skit can be found here). Using Kenneth Burke’s poetic categories (epic, tragic, comic, burlesque, grotesque, didactic, elegy, satire), Smith and Voth demonstrate how a comic perspective “allows society to confront problems” and “allows for a new form of understanding that is otherwise not possible” (p. 111). They provide a chronology of the polls showing how SNL and the candidates’ reaction to SNL drastically changed public opinion. Originally, Gore was leading by a two point margin. After SNL’s parody of the first Presidential debate, however, the polls quickly shifted in favor of the Texas Governor. But why? More and more research shows that people are relying on comedians for their sources of current events (which is why there was recently a boycott of the number 7 because it was heard that it 8 9… sorry I’m a professor not a comedian). Smith and Voth cite the Pew Research Center for People and the Press to state, “47% of people between the ages of 18 and 29 obtain most of their political information from late-night entertainment outlets” (p. 110). Other studies, like Don Waisanen’s study on Jon Stewart and Stephen Colbert as “comic rhetorical critics,” demonstrate the over increasing reliance on entertainment-for-news by U.S. audiences. Smith and Voth state, “Willing or not, late-night television comedians are an important disseminator and arbiter of information for political officials, marking an era where humor could potentially act as a valid form of political argument” (p. 110). Rather, they are showing humor that works. Humor that works, however, is contingent upon acceptance and rejection. Smith and Voth contend that Bush accepted his role as the “common clown” or “fool,” and that his acceptance of this role allowed him to come off more honest to the public and more down- to-earth. On the other hand, Gore rejected his parody and used it “in order to correct his perceived haughty and pompous behavior” (original italics, p. 117). In the subsequent debates, Gore continually used SNL to shape and correct his mistakes. In every debate he was a new man–a new man the U.S. public didn’t know or trust. His rankings in the polls quickly shifted. Smith and Voth show that it wasn’t until Gore embraced the comic frame (realizing the important role humor plays) before he began to climb again in the polls. This year’s election is sure to bring amazing skits and parodies from SNL and other late-night comedians, and the candidates’ behaviors and reactions will definitely shape the final outcome. Ultimately, we know the results of the 2000 election and see how humor affects politics. Smith and Voth conclude, “The manner in which the Bush team used comedic mockery of the Texas Governor to their strategic advantage illustrates how humor and comic actions deserve consideration as a valid form of political argument” (p. 126). 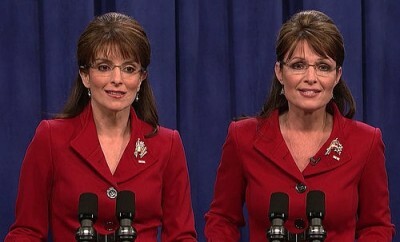 The 2012 candidates will have to embrace this new form of political argument and accept their parodies on late-night television. Although Tina Fey will not get a chance to reprise her role as Palin is no longer running, we can hope comedians poking fun at the candidates’ clownish behaviors will be exemplified in the same brilliant manner, showcasing humor that works. Burke, K. (1959). Attitudes Toward History. Los Altos, CA: Hermes Publications. Smith, C. & Voth, B. (2002). The role of humor in political argument: How ‘strategery’ and ‘lockboxes’ changed a political campaign. Argumentation and Advocacy, 39, 110-129. Waisanen, D. J. (2009). A citizen’s guides to democracy inaction: Jon Stewart and Stephen Colbert’s comic rhetorical criticism. Southern Communication Journal, 74 (2), 119-140.